E+E Elektronik’s new EE872 CO2 probe measures CO2 concentration up to 5 % (50000 ppm) and features active pressure and temperature compensation with on-board sensors. The heated, replaceable CO2 sensing module and the long-term stable dual wavelength NDIR operation principle lead to outstanding measurement performance even under harsh and condensing conditions. 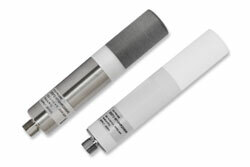 With its temperature range -40...60 °C (-40…140 °F), the EE872 is appropriate for most CO2 monitoring applications. The multi-point CO2 and temperature adjustment ensures best accuracy over the entire working range. The probe incorporates the E+E dual-wavelength NDIR CO2 sensor, which is highly insensitive to pollution. Due to auto-calibration, the sensor also shows excellent long-term stability. On-board sensors compensate the effect of temperature, altitude or weather changes on the CO2 measurement. This leads to highly accurate CO2 reading independently of the environmental conditions. The heating prevents condensation inside the sensing head. Thus, the EE872 is appropriate for use in in high humidity and condensing environment. The modular design facilitates the replacement of the interchangeable, pluggable sensing module. The robust IP65 stainless steel or plastic enclosure and the replaceable PTFE filter cap provide optimum protection against contamination. With a special catalytic filter, the CO2 probe is suitable for applications with periodic H2O2 sterilization. The EE872 provides the CO2 measured data simultaneously on current and voltage outputs or via RS485 interface with Modbus RTU protocol. Configuration and adjustment can be performed comfortably with the free configuration software and an optional adapter cable.